Living to Tell the Story: I have a really, really good excuse. No really! I have a really, really good excuse. No really! I should know better than to make a promise that might go unkept. And that is exactly what happened with the FFF. I so did not make it back to do a post. And I know. I am the one who is always saying how beneficial looking for good blessings in our lives is, especially when we are busy and don't always notice the good things. I know I get on my soap box about it. But I have a good excuse. I really, really do. I had to take a Child Care First Aid course that went Thursday and Friday night from 6 p.m - 10 p.m. and Saturday from 8 a.m. - 4 p.m. for my job. After a 7:30 a,.m. - 5 p.m. workday it was tough stuff. I barely had time to throw some food into me before heading out for the 4 hour class. And the information overload totally swamped my brain. This brain has not crammed like that since college, people! And I work with little kids all day so it's not like I am really used to having to study. 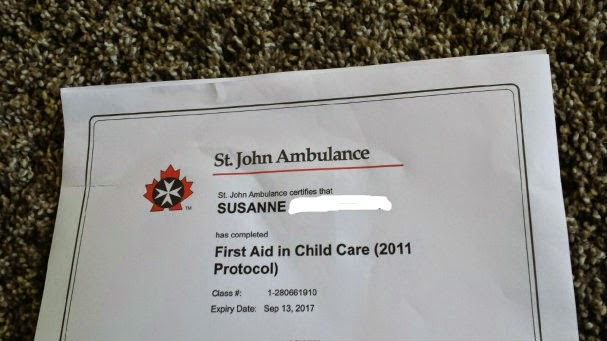 It was a course designed not only as a basic first aid type of course but also adjusted specifically for child care providers or those who deal with children. My poor brain felt slightly majorly taxed and stretched to it's limits. I came home and literally crashed each night. I could not think anymore. But I did it! I survived... And I passed! Yay me. Now I hope with all that cramming and practical practicing in class that they gave us I can just recall all that info if ever the need arises. And now no more excuses. Back to regularly scheduled programming next Friday!! My head would be spinning, too. No worries! Congratulations! You do have a very good excuse! I would have had a really hard time maintaining that schedule for a couple of days! I think we've all had weeks we just couldn't get to a post - not that there weren't things to be thankful, about, there just wasn't time to write them down then. Congrats on,passing! But you weren't the only one who didn't do,the FFF!!! I just might share 10 this week to catch up!!! Well congratulations for passing after all of that hard work! I sometimes fear what would happen if I ever had to go back to school and learn something new (that required a test!). I'm impressed. :) I bet you are glad that is over!